Something weird happened on my local dev machine. 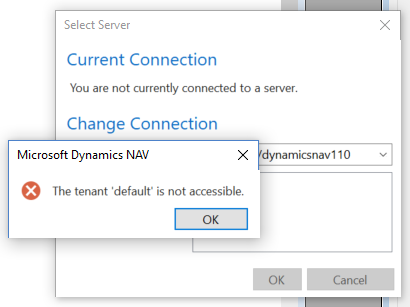 I have a standard installation of NAV2018 installed, currently upgraded to CU2. 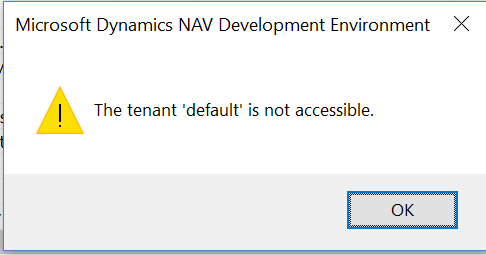 Suddenly I’m swamped with messages about the default tenant is not accessible. The strange this is that if I restart the service tier I can download symbols once, but if I try to download them twice, I’ll get the above error the second time? And boom, this because I had deleted a table without syncing the database (I was working on an uplifting concept). Use the PowerShell Sync-NAVTenant command to fix the missing sync.